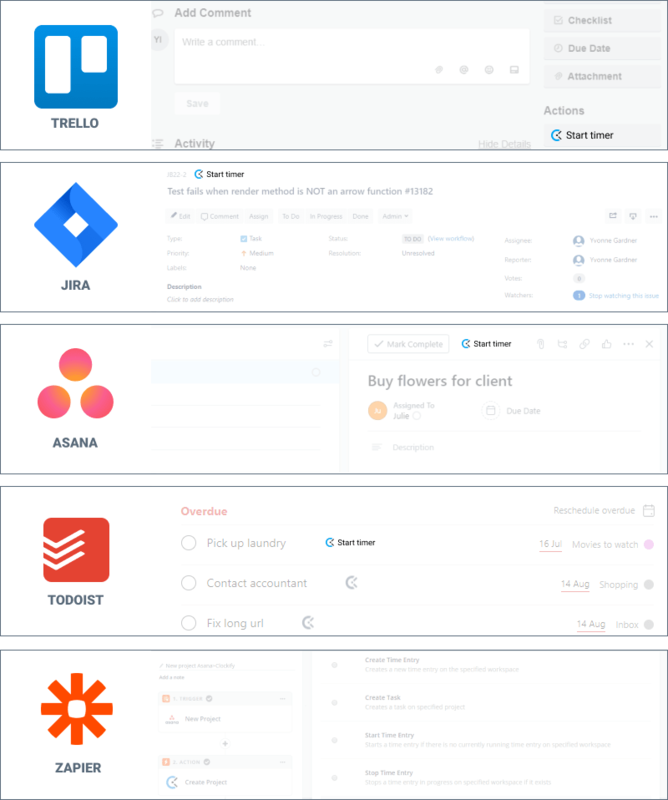 Start Clockify timer from within other web tools, like JIRA, Trello, Asana, and others (see integrations page for the full list). Simply install the Chrome extension or Firefox extension, and a timer button will appear in your favorite web app’s tasks, to-dos, issues, leads, events, etc. The extension can also pick up project name from another app if there’s a project in Clockify with the same name (eg. example, you have a “Project X” in both Clockify and Asana/JIRA/Trello. If you want to keep projects synced, you can use Zapier (eg. when a new project is created in Asana, create it in Clockify too, and vice versa). If you don’t want the button to appear in certain web apps, you can disable it in URL Permissions (open extension and click on options icon in the upper right corner). If you use a self-hosted on-premise version of some app (like JIRA or Gitlab), you can specify your domain in URL Permissions so the button appears in the right place. If you have Timesheet enabled, project is automatically a required field. To stop the timer, you’ll have to open your timer and select a project. Tip: you can set a default project so each time you start a timer, project is selected automatically (you can enable it by opening the extension and go to Settings). No problem. In the extension options, select “URL & Permissions”, scroll down to the bottom, select the tool you’re using (eg. Gitlab), and enter your custom domain. If you don’t see the button, first make sure you’re logged-in in the extension. If that doesn’t help, restart the browser. Also, make sure the integration is enabled in URL Permissions (when you open the extension, click on options icon in the upper right corner). If you still don’t see the button, send us an email and we’ll look into the problem (this happens sometimes when there are updates to the app). Drop us a line at support@clockify.me and tell us about the tool you want supported. If there’s enough people, we’ll add the integration. If not, you can create it yourself once we open source the extension and make the code public. That’s great! We’ll soon open source the integrations so others can contribute. If you’ve developed an integration using our API, be sure to let us know so we can feature you on our Integrations page.